We’re all aware of how powerful Facebook advertising can be when it comes to expanding a business’s reach. Or, at least we should be. 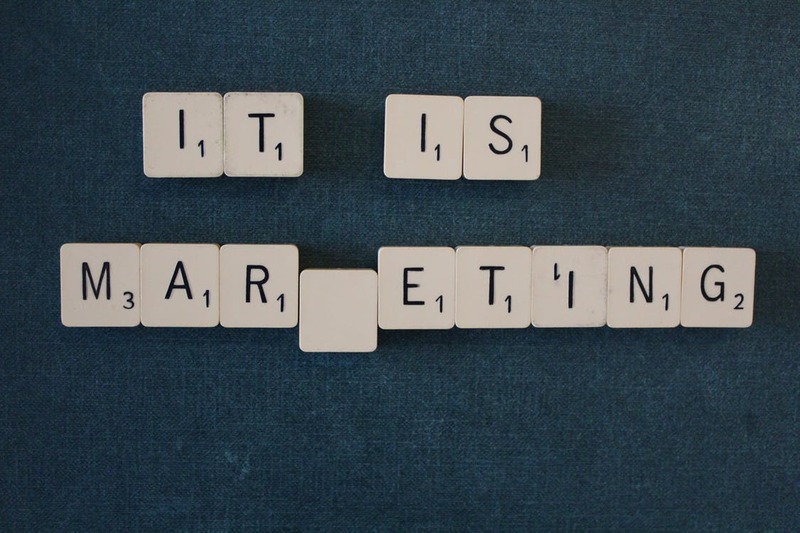 But, are you weaving it into your marketing strategy just yet? It’s a must do. You definitely can’t skimp on it. It can oftentimes cost you some serious, hard-earned moola. And, be a complete success or total flop depending on your game plan. Sure, if you’re Nike or a large restaurant chain like Chipotle, that cost probably doesn’t mean much. However, you, my friend, are one of 28 million small businesses across the United States. You probably don’t have a ginormous chunk of change lying around to put towards testing out new marketing and advertising efforts. Every penny counts, right? Absolutely. So, what’s the solution to getting your business out into the world on a dime? Facebook ads. It’s completely cost-effective. Buffer even wrote an article on what $5 per day on Facebook can get you and your business. Yet, maybe you haven’t been ready to tap into this arena for one reason or another. You assumed it would cost you an arm and a leg because, well, it’s advertising. And, you’re not alone. 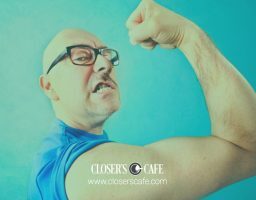 Statistics show there are 50 million active small business Pages on Facebook. But, only 2.5 million Pages are actually paying to be “active advertisers.” Hm. That’s kind of disappointing. Don’t you think? 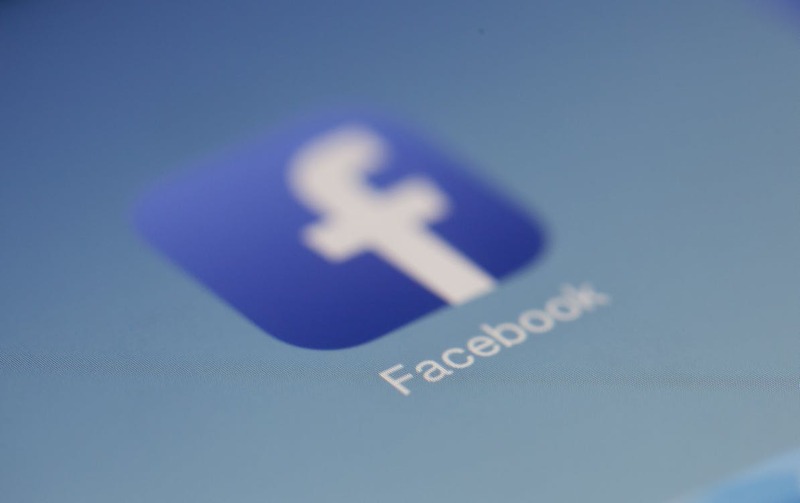 No matter your reason for holding back from advertising on this popular social media platform, there are countless entrepreneurs out there who’ve enhanced their leads, sales, and so on thanks to Facebook ads. Yes, really. And, that’s why I’m here today—to share with you 13 real-life examples, proving advertising on Facebook can work not only for these small businesses, but for yours too. So, whether or not you decide to take the plunge afterwards, you’ll be well equipped with some grand slam stories to start copying right away. 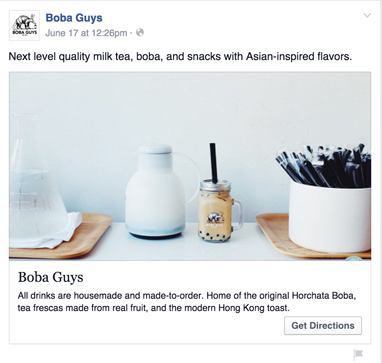 When this Asian bubble milk tea company wanted to open another storefront, it looked to Facebook to run a local awareness ad campaign. Why? Well, it offered a chance for Boba Guys to gauge local interest in a potential new location in San Francisco. All while driving foot traffic to its existing stores. This campaign was created to reach people within a 1-mile radius of the neighborhood of the potential new store. And, the call to action—”Get Directions”—linked to an existing location’s directions. Its ad images are crisp and clean. Just what we like to see. But, the real fun came with the copy, which oftentimes featured polarizing statements encouraging fans to comment. Equally important, however, was mixing in a few ads that highlighted the brand’s values or tied in with current events (ex. April Fools’ Day). 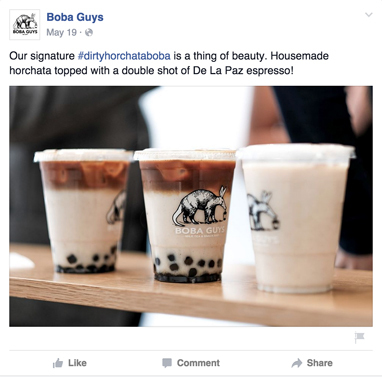 Above all, no matter the occasion, Boba Guys never missed a moment to come up with an entertaining and creative hashtag related to some of its menu items. If it’s suitable for your brand, have fun with your ad’s copy. Keep it lighthearted and engaging—create your own hashtags to spark a conversation. Tie it into current events like national holidays/food holidays. Be bold. 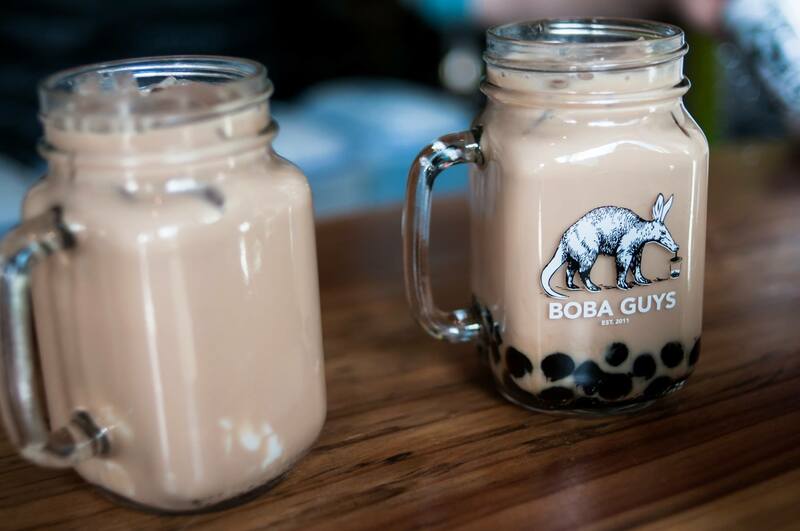 Doing these things is exactly what helped put Boba Guys on the map. And, it can help you do the same, too. 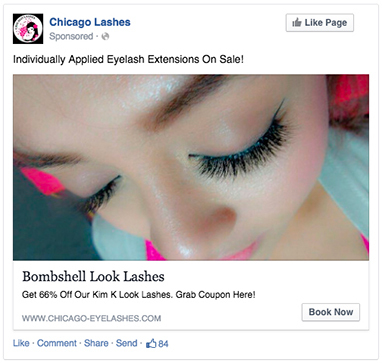 This Chicago salon, specializing in high-end, yet affordable eyelash extensions, looked to Facebook to draw new customers into its space while encouraging current customers to return for a lash refill every 3-4 weeks. So, to do just that, it utilized the social media platform’s offer ads to serve up an enticing offer. Chicago Lashes gave its audience a serious deal—66% off its “Bombshell Lash Package.” And, it relied heavily on customer trends to determine the best time to execute: the Halloween season. Interesting enough, the salon found that more women are interested in a dramatic eye look around this time. Most importantly, while making use of Facebook’s Custom Audiences and Lookalike Audiences features, the store focused on women between the ages of 24-55 years old, located within a 20-mile radius of the store, as its target. Not to mention, those interested in beauty, makeup, spa, Kim Kardashian, and Oprah Winfrey. Think people clicked the call to action button—”Book Now”—to contact the salon and redeem this exclusive offer? Absolutely. Targeting is a crucial component of a successful ad campaign. Not only did the company solidify an ideal timeframe to run the campaign based on the season, but it also zeroed in on its ultimate customers using appropriate locational radius, age range, and interests. 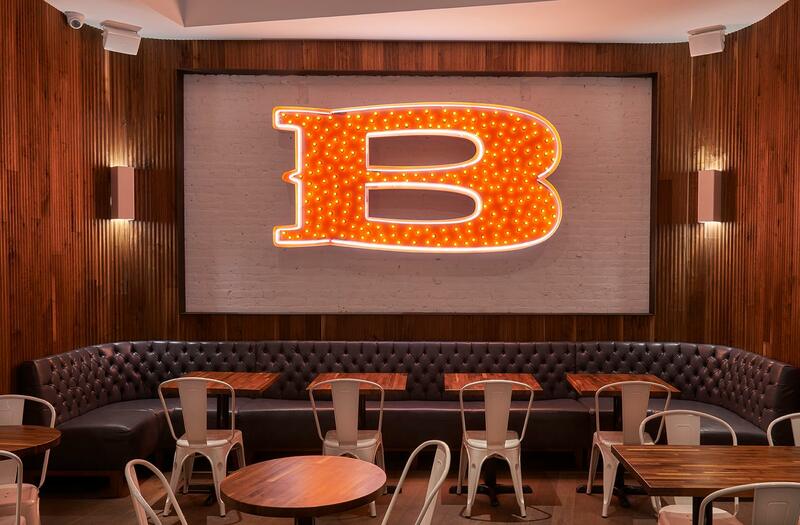 A New York-based bakery serving Brooklyn and Manhattan, Baked NYC looked to Facebook to enlarge its customer base. All while encouraging a broad audience of baking fans across the country to sign up for its e-newsletter. 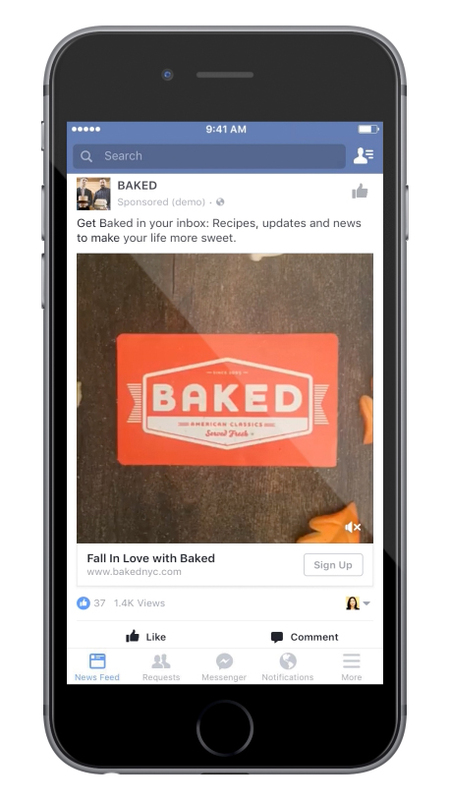 To accomplish this goal, it actually teamed up with Facebook’s Creative Shop to craft short videos, bringing its mouth-watering baked goods to life via lead ads. 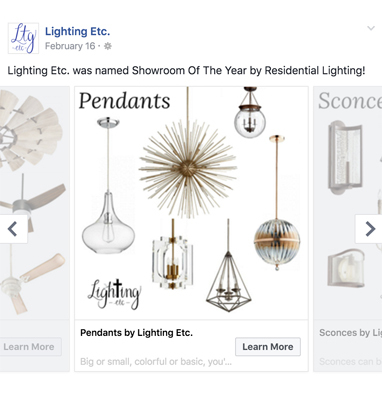 Using lead ads helped the shop collect information from its ideal audience (excluding fans of its own Facebook page, of course) for its email signups. Once Facebook users clicked the call to action button—”Sign Up”—they were directed to a context card explaining exactly what they were signing up for. And, lastly, a form that was automatically filled in with contact information from their Facebook profiles. Those bright, close-up product shots of scrumptious pies (yum!) definitely got people’s attention. You don’t need to spend an arm and a leg to pull a video together like Baked NYC’s. They did it all using a $20 tripod, $15 clamp lamp, a phone, and a variety of apps to create stop-motion videos with animated text overlays. So, it’s absolutely doable—no excuses. 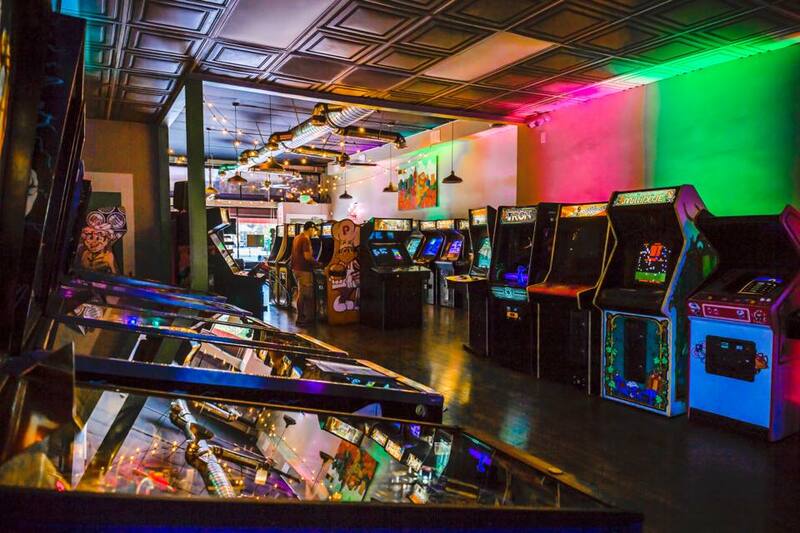 This Pasadena, California-based arcade, hosting more than 50 video games and pinball machines, is without a doubt an awesome throwback entertainment venue. So, when the husband-and-wife founders wanted to spread the word among its neighbors, ultimately bringing in more customers, it looked to execute local business promotion ads via its Facebook business Page. Neon Retro Arcade’s ad campaign images are colorful and definitely eye-catching, while drawing attention to the arcades features. Plus, the venue makes it easy for Facebook users to find its location—just swipe through the ad’s images and you’ll land on the map, encouraging a visit. 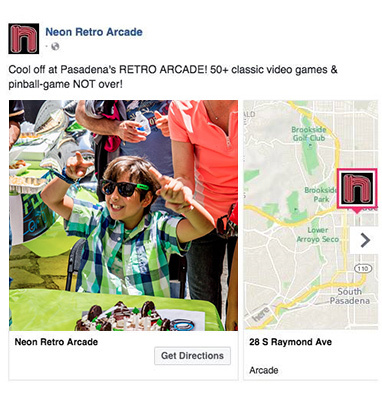 Despite relying heavily on print ads in the past, Neon Retro Arcade decided to suspend its costly traditional ad spending once it realized most of its guests discovered the venue via local business promotions. Now, the owners can continuously reach a larger audience much faster and at a fraction of the cost. Winning! Facebook advertising is completely affordable, and oftentimes, can save you some money when compared to traditional print ads. The best part? 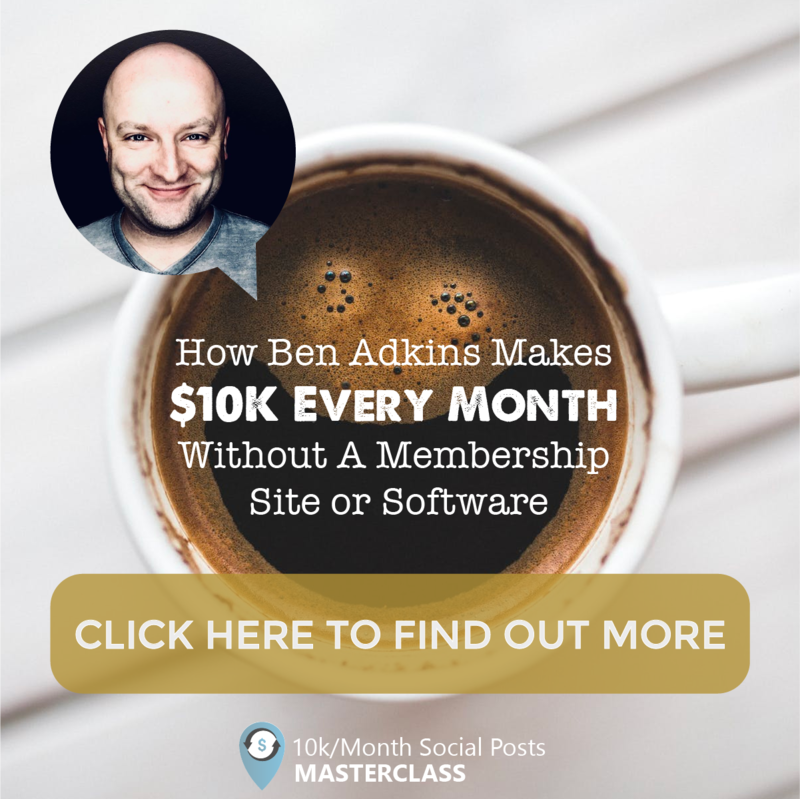 Facebook ads are fairly easy for entrepreneurs like you to set up. So much so that the owners of Neon Retro Arcade often create them on the spot via their mobile phone during slow periods. Lighting Etc., a third-generation, family-owned and operated lighting showroom, carries more than 37,000 lighting fixtures at its 4,000-square-foot space. And, like many small businesses, it didn’t have a substantial amount of money lying around to dedicate to advertising campaigns. So, it teamed up with a Facebook Marketing Expert (not currently offered to all advertisers just yet). Doing so provided the company with an extra boost to accomplish its goals—enhance brand awareness and, ultimately, draw more locals into its physical location using Facebook video ads and carousel ads. As if Lighting Etc. isn’t already busy enough keeping up its extensive shop, it produces its creative in-house, gleaning ideas from popular HGTV design shows and personal knowledge of customers. This helps determine the most effective, creative ad formats—from video to photos—to showcase installed fixtures. And, to make the most of core targeting while reaching the ideal customer, the focus was on: a married woman, ages 25-45, with some college education, who owns her own home, and lives within 35 miles of the showroom. Not to mention, with interests in HGTV, Wayfair, and interior design. Don’t be afraid to ask others for help—aka experts that can get you on the right track when it comes to getting started with Facebook advertising. Doing just that helped Lighting Etc. organize its campaign ideas, obtain a greater understanding of various marketing tools at its disposal, and answer any questions, ultimately leading the company to greater success. 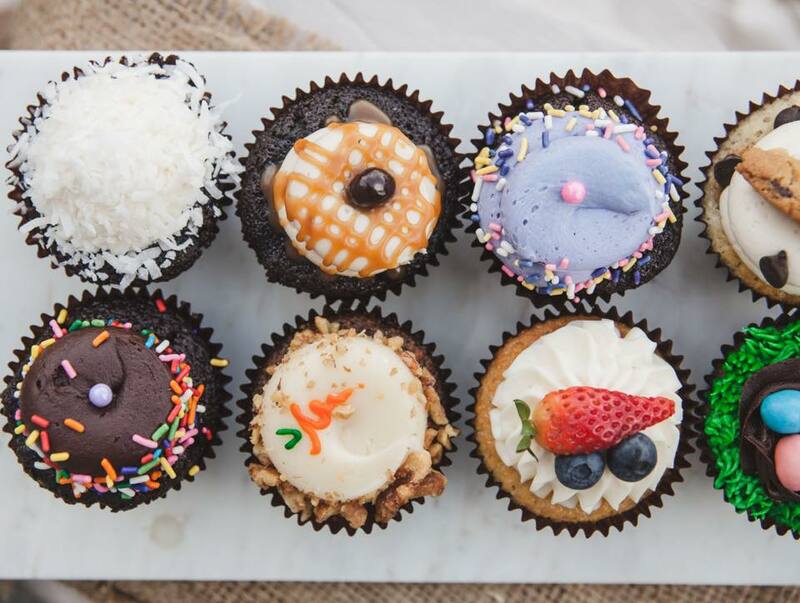 While Cupcakin’ Bake Shop, located in Berkeley, California, has catered to huge corporations like the Oakland Raiders, Chevron, and Clorox, it desired to increase local awareness and bring in more customers. The ticket to get there? Local business promotions via its Facebook Page to promote the shop’s physical location and catering business—all at a reasonable cost. When it came time to zero in on the ad’s target, the focus was on people ages 18-55, living within 5 miles of the shop. At the same time, interests such as weddings, flowers, and cupcakes (of course) were also targeted. 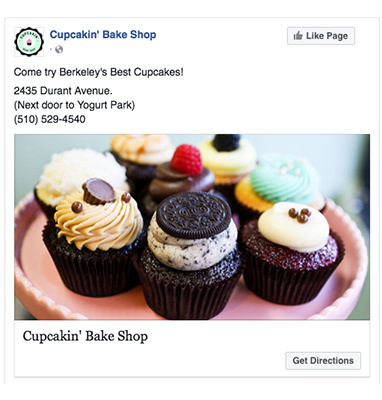 With simple copy, delectable shots of its baked goods, and a call to action (“Get Directions”), it’s no wonder Cupcakin’ Bake Shop was able to effectively encourage people to stop in for a visit. If simplifying your ad’s copy will generate the best results among your ideal customers, similar to Cupcakin’ Bake Shop, go for it. Don’t try to get all wordy and use unique lingo that might not resonate with your people. After all, no brand is created equal. 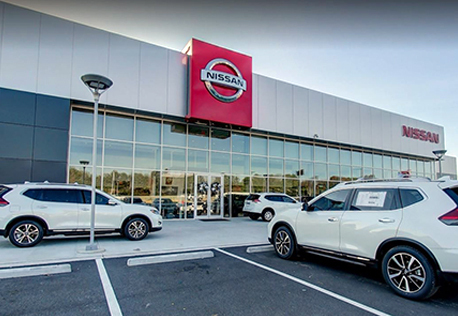 Asbury Automotive Group, one of the largest automotive retail and service companies in the United States, expanded its brand with a Nissan dealership in the Doraville, Georgia area. 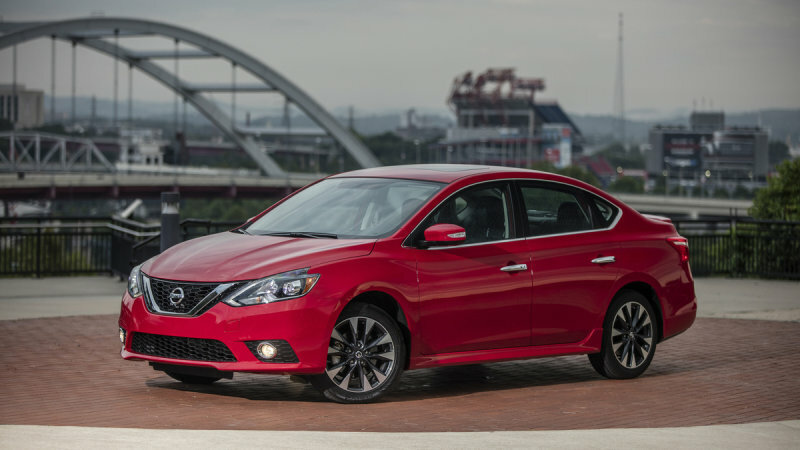 For that reason, it needed help spreading the word to its new neighbors, while increasing vehicle service orders among Nissan owners who choose independent auto shops instead. Enter Facebook. The company looked to lead ads, helping drive people interested in service appointments into its doors. Once users hit the ad’s “Sign Up” call to action button, they were directed to a pre-filled form, making it quick and easy for them to share information regarding a desired service appointment. The campaign wouldn’t have been nearly as successful without the automotive group’s partnership with Oracle, a database management company. As a result, it was able to identify consumers who were considering purchasing service packages, and, ultimately, hone in on its exact target audience. This newly collected information was then used to create a Custom Audience of people who previously declined service packages. 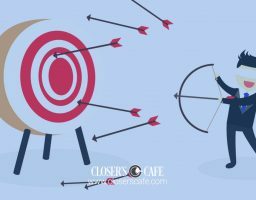 If you don’t have a clear picture of the exact customer group you’re hoping to target, there are many applications and resources out there to help you. Putting them to use will support you with enhancing your business’s marketing and sales efforts. When the time came around again for DJ Mag’s Top 100 Clubs voting, Exchange LA nightclub not only looked to Facebook advertising to rock the vote, but also to amplify brand awareness among dance music fans. 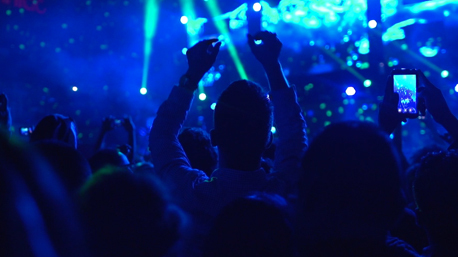 The campaign centered on video ads, helping capture the energetic venue and its events. So, for the greatest possible reach, these ads ran continuously across both mobile and desktop News Feeds, as well as Instagram, over a 2-week timeframe. All while featuring a simple call to action—”Vote”—taking people directly to the Top 100 Clubs poll landing page on the DJ Mag website. Is your business in the running for a nomination within a large poll (ex. Best Of [Enter Your City Name])? Make use of Facebook ads to amplify your voting efforts. Don’t be shy! It’s the perfect opportunity to further spread the word among your audience. ShopRite Supermarkets looked to grow relationships among millennial customers while starting stronger and more personal conversations about its locally grown produce. Thus, Facebook was the go-to. The campaign focused on link ads directing people to the appropriate local Facebook business Page. 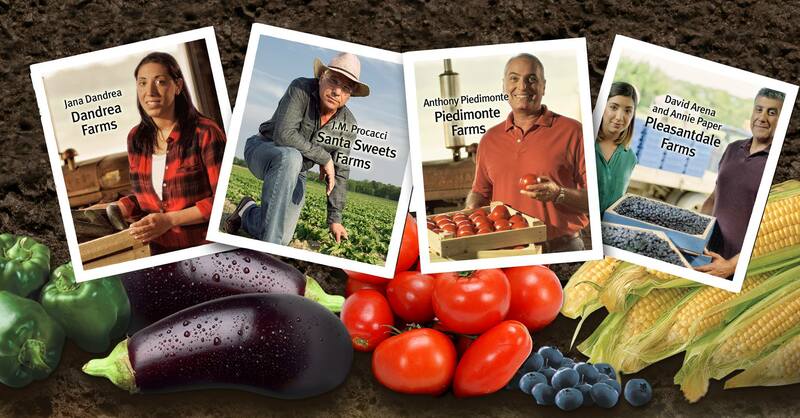 Not to mention, video ads educating viewers about its support of and work with local farmers. 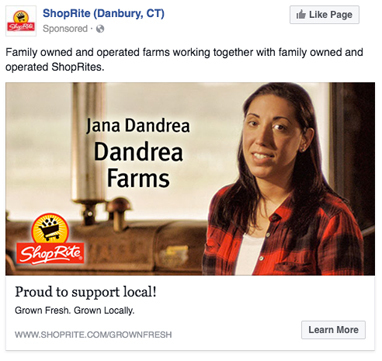 Drizzling in a human touch—featuring local farmers sharing the amount of care they place into growing products to be sold at ShopRite Supermarkets—was key to the ad campaign’s success. And, when coupled with copy centered on the effort and attention taken to select local farmers and the freshest produce, it was a win-win. For targeting purposes, Custom Audiences were used to ensure the right people were reached—like Facebook users who are fans of its individual store Pages. And, Lookalike Audiences came in handy to find more users like them. 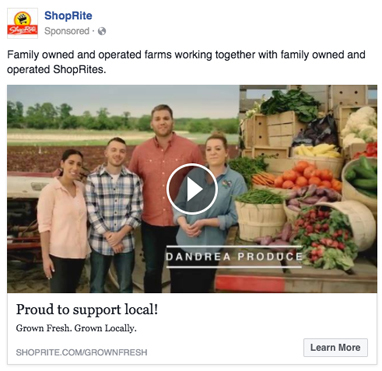 Applying emotional marketing to your Facebook ads like ShopRite Supermarkets—helping customers see who they’re supporting when they purchase local produce—can allure your audience to make a purchase and become loyal customers. 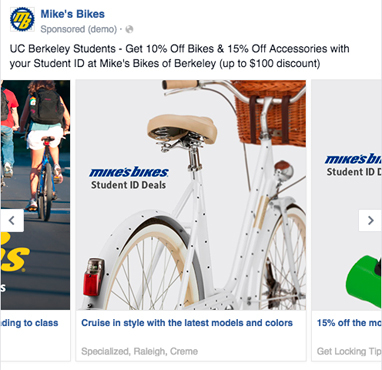 This Northern California bike retailer wanted to boost awareness of its in-store student discounts among local college communities. So, what was the easiest, most cost-effective way to successfully do just that? Facebook carousel ads. This ad format helped display multiple products, supporting the goal of driving in-store sales, and building relationships with new college students moving into the neighborhoods of each store location. The August through October campaign featured 5 photos. These shots included related products from the retailer’s online catalog, like a bike, helmet, bike lock, store logo—all up against a stark white background for a crisp, clean feel. Mike’s Bikes also teamed up with a creative designer to capture experiential/lifestyle photos starring employees going out for a ride. But, not all ad was created equal as it developed different creative pieces according to the university and gender it was targeting. 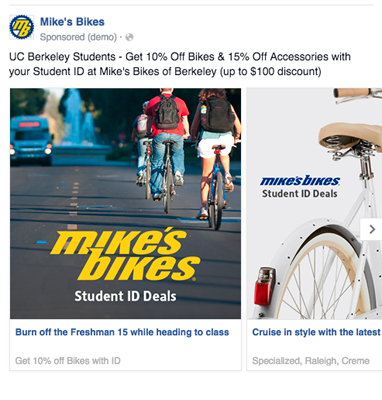 For example, an ad reaching UC Berkeley students ran with the following caption: “This is a UC Berkeley special.” Men saw darker colored bikes, while women saw cruiser-style bikes with a polka dot finish. Carousel ads have up to 10 times higher click-through rates compared to static posts on Facebook. Plus, they give you the chance to display up to 10 products/offers at a time instead of just one. As a result, there’s a much greater chance at least one of the images you choose will appeal to the viewer. Don’t miss out on this opportunity for success! Oh, and don’t be afraid to create various versions of ads to target multiple customer groups. 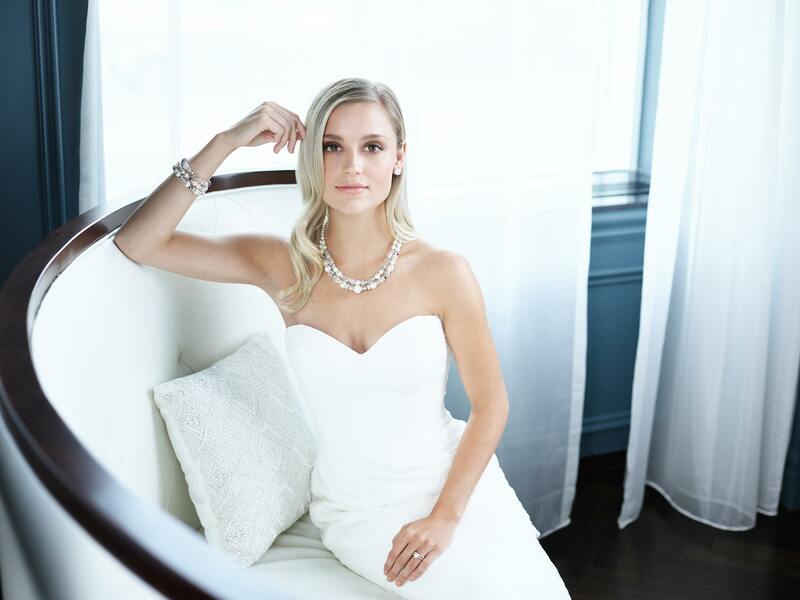 In preparation for the 2016 holiday season, Hillberg & Berk, a designer and seller of artisan jewelry, wanted to reach women with ads that gave off a lookbook or gift-guide feel. Ultimately, making things a little easier for their audience during such a busy time of year. So, to accomplish this, the brand used a variety of Canvas ads for its “Making Spirits Bright” campaign. Canvas—an easy-to-create, fully immersive experience—gave it the opportunity to showcase its products. Using the perfect mix of bright and stunning product and lifestyle images—showing models wearing the jewelry as well as videos with item descriptions—Hillberg & Berk was able to recreate the experience of browsing through a captivating gift guide. 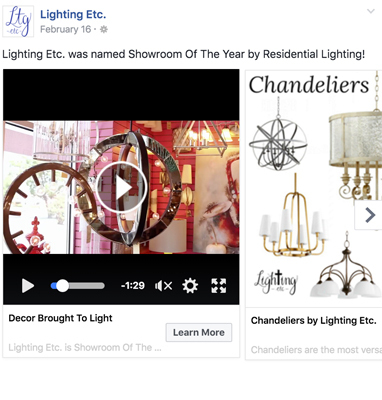 And, most importantly, the retailer optimized its ads for conversions, tracking the results with the Facebook pixel. Cha-ching! Outshine your competitors and create a one-of-a-kind ad campaign unique to your brand. Yes, it’s great to pull ideas from small businesses you idolize and love. 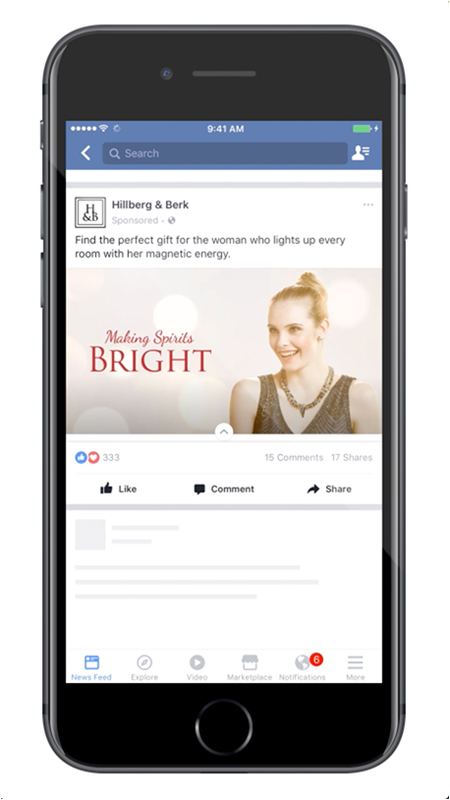 But, follow Hillberg & Berk’s lead and brainstorm what ways you can make your ad stand out from the sea of those displayed across your audience’s News Feeds. 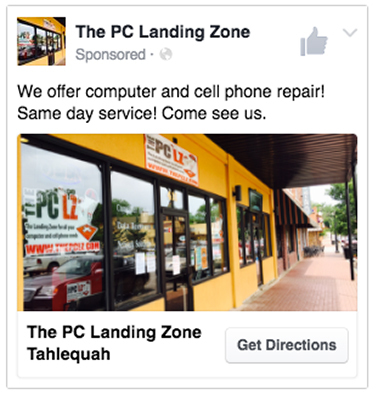 This computer and cell phone repair shop initially found success in growing the business with Facebook advertising. But, it was time to build upon that achievement, continuing to raise awareness of its services and encourage people to bring their electronics to the store for repairs. And, this was accomplished with the help of Facebook’s local business promotions, bringing new and returning customers within 25 miles to either of the two repair shop locations. 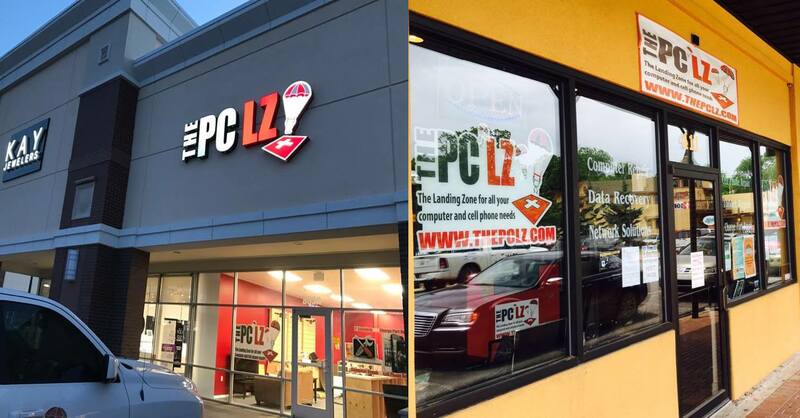 These ads pointed to the company’s location and featured an image of The PC Landing Zone storefront. Meanwhile, the copy promoted the drop-off or at-home same-day service. Additionally, the ads incorporated a “Get Directions” call to action button, directing the audience to the location nearest them and giving them an easy way to contact the business. Find a compelling unique value offer (UVO) and mention it in your ad’s copy. 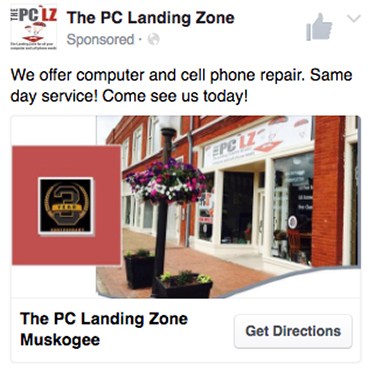 The PC Landing Zone didn’t hesitate doing just that—calling attention to its at-home same-day or drop-off services. Consider it to be your strongest selling point, convincing your people they need your product or service, and its benefit to them. 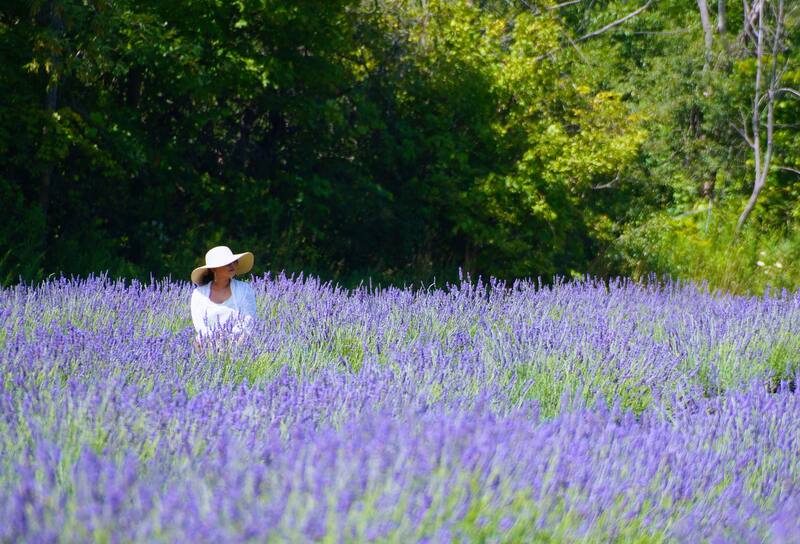 This agro-tourism venture, offering farm tours, lifestyle classes, and lavender products to its visitors, wanted to increase brand awareness of its unique destination. 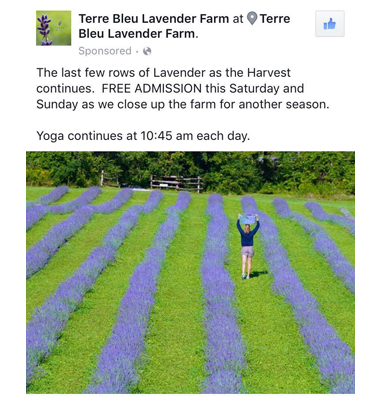 And, thanks to the Facebook Ads Manager, Terre Bleu Lavender Farm did just that. Using Page like ads and boosted posts, the farm attracted locals to its Facebook page, in turn, driving them to visit the fairly new day-trip destination. When creating these ads, Terre Bleu experimented with imagery to get a better feel for what types of creative would generate the greatest level of engagement. Photos of rich purple lavender fields, flowers, and people in those settings seemed to be the best sellers, so to speak. 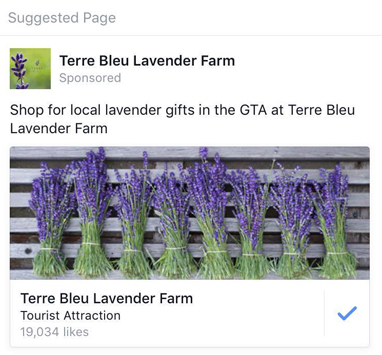 Most importantly, the farm found that timing is everything when it comes to Facebook advertising. It timed the release of ads and boosted posts on certain days and at certain times that had the most impact—like before a long weekend. “The messaging on your ads can change hour by the hour,” Moses Velasco of Socialbakers says. Thus, just like Terre Bleu, it’s important to consider your audience and concentrate on the best day of the week, and even hour of the day, to post your ad for the greatest possible engagement. Lyrical about Facebook ads, now? Success! Go forth and harness all these examples to produce a winning campaign of your own. You’ve got this. *All real-life examples pulled from the Success Stories section of Facebook Business. Find more here. Now, you might be thinking there are countless out-of-this-world Facebook ad examples to copy. But, that’s not 100% true. 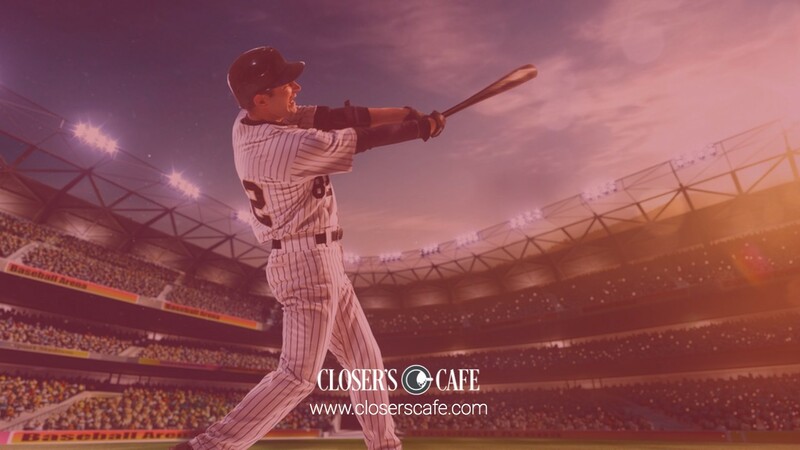 It’s not easy to create a grand slam campaign that wins the hearts of your customers. These examples, however, can get you going on the fast track towards success in conjunction with our 8-step playbook for a conversion homerun. And, if you want more of what was shared here today, and help navigating the oftentimes-murky waters of Facebook advertising, join AdLab now. 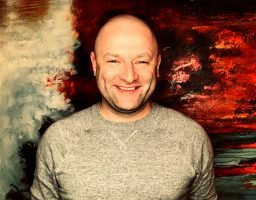 It’s an ever-evolving course on Facebook ad strategy, guiding even the most seasoned pros to success—growing their businesses and generating profit for years to come. 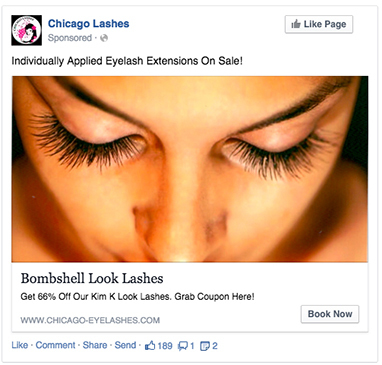 Are you already using Facebook advertising for your small business? Let us know how it’s working in the comments section below. We’d love to hear your success story.